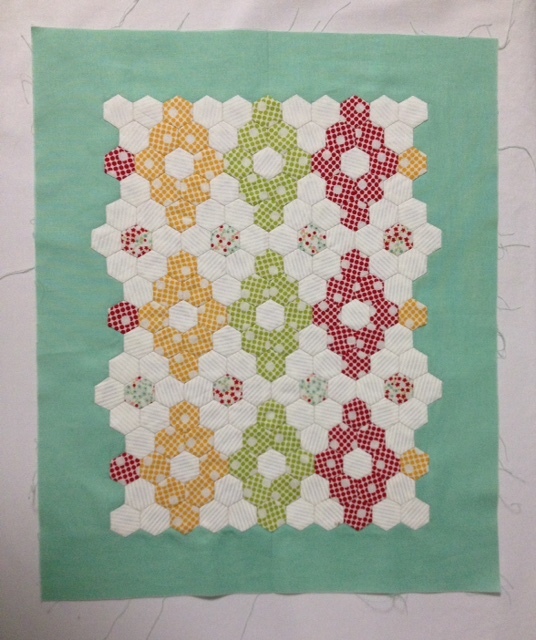 Quilting Adventures: Plugging away ....! Too hot here, the humidity slows me down. That is charming and soooo tiny! You can send some water our way. Very cute Carole! 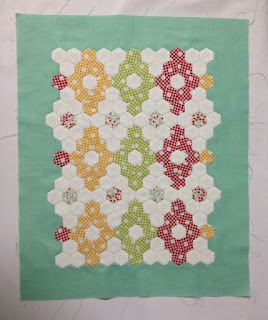 I've had a hard time loving EPP -- preferring straight hand-piecing instead. Methinks more practice is in order! It is beautiful, love the pattern and fabric choices! I've just finished and blogged about a mini EPP too! That came out fantastic! A friend just got me started with EPP, it is a lot of fun. What a cute little quilt. I have used 1/2" for one of Lynette Anderson`s patterns as an applique. Have you seen http://www.suedaleydesigns.com/. She has a hexagon SAL that she has started. I have put part 1 together of my colours and waiting on fabric for part 2. Happy Stitching.